Summertime is filled with beautiful flowers and sometimes you want to bring the outside in with pretty cut flowers. But how to arrange them? 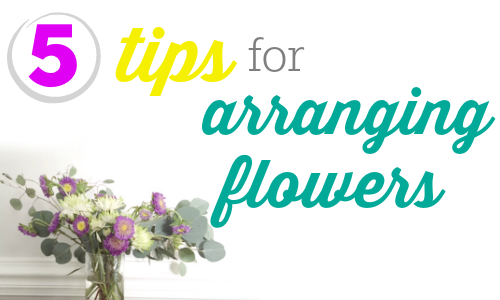 There are some simple tips on how to arrange flowers to help them stand out. First, let’s start with some basic tools. I like to keep on-hand a good, sharp pair of pruners and chicken wire. 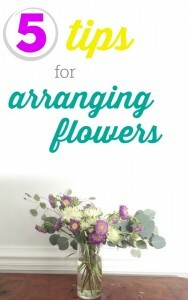 If you’re making an arrangement in a low vessel, the flowers need a structure to hold onto. This also allows you to spread the flowers out a bit more to create a more natural look and give you more bang for your buck. One method is balling up chicken wire to form a base in the vessel for flowers to stick out of. Another option is using Oasis which is the soft green blocks you’ll see in a number of arrangements. Fill a bucket with water, put the Oasis in the bucket to soak and transfer it to the vessel to stick flowers in. If it’s a taller vase, make a grid on the top of the vase using tape. Adding greenery to a bouquet can make it much more full at no cost. Head outside and get some long stems of greener from the yard, create a base of greenery and add your flowers next. If you are using a tall vessel for your flowers, use lace the stems of the greenery together underwater to create something for the other flowers to rest in. Don’t overcrowd your arrangement. If the flowers are looking a little tight, fluff them in the vase and maybe even put some loose greenery in the mix to add an airy feel. When you buy cut flowers, sometimes the bottom of the stem is a bit dead. First thing you should do when you buy cut flowers is cut the bottom of the stems. Cut all of the stems at a 45 degree angle so they can get the most water. Remove all of the leaves that will be in the water. If there are leaves or petals in the water, they’ll degrade and dirty up the water more quickly. You can also remove any leaves above water that may make the arrangement look messier. When you’re making an arrangement, think about where it’s going to be in the house. The shape of it could differ depending on what the height of the table is. I make my arrangements on a table the same height as where it’s going to go so it will look the same as I envisioned when putting it together.